Get a FREE Shaved Ice at Kona Ice on April 15th! 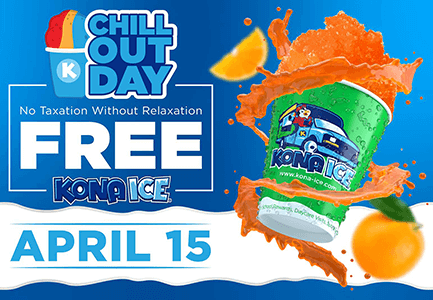 – On April 15th, Tax Day, we’re giving away FREE Kona Ice in an effort to help people chill out and relax – we call it Chill Out Day! Why? Because we believe in no taxation without relaxation. Come chill out with us!